Anything Under Kenny: Hello Autumn! Autumn, Autumn, my favourite season. The gloomy atmosphere that October brings makes me feel like I am on the set of Twilight. Do not mistake me for being a Twihard, I just have this sense of nostalgia from years back of what October feels like. That scene from Twilight where Bella was saved by Edward from a supposed car crash is a murky scene that I am addicted to with Collective Soul’s Tremble For My Beloved song on the background that is just right on for the scene. When October steps in, I remember having this high level of elation and excitement. Because of Halloween and my birthday, where I expect to have fun and candies. Having this weirdness of looking forward for something shocking and different to happen on my birthday or on Halloween. Maybe, like ghosts appearing unexpectedly and all the imaginative craziness I have on my mind when I was 7. However, as I get younger and wiser, all of this feeling of excitement tend to fade away but still embarked until today. I want to go trick-or-treating once more! haha. If I were to attend a costume party on Halloween, I want to play “A” on Pretty Little Liars. Psycho! 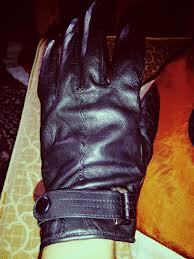 From a sale store at a mall, I found this black leather glove with Rudolph Valentino on its tag. The other pair went missing, but still I bought it for only 10 pesos! On that note, I am still that little kid wishing for something extraordinary to happen on Halloween. Of course not something that will hurt anyone. Hello October!